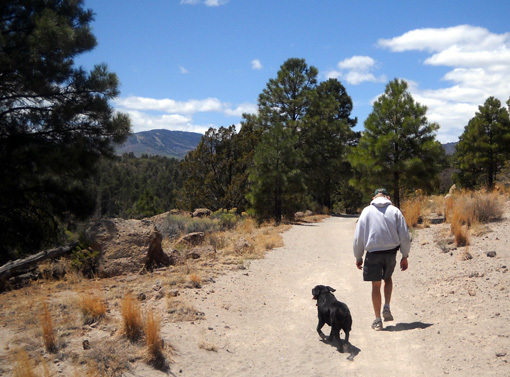 Sometimes Jim and I return to trails we've enjoyed on previous visits. They are familiar, and we know pretty much what to expect. 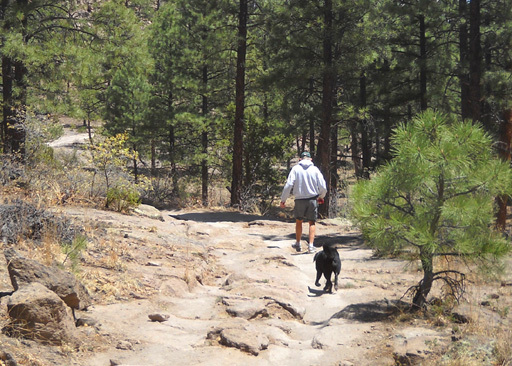 We also like to explore trails that are new to us. 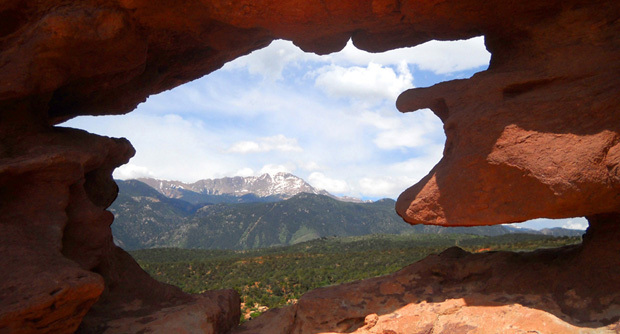 There's nothing much better to me than discovering an interesting place I've never hiked, biked, or driven before. What's-around-the-next-bend or over-the-next-hill is good, adrenaline-inducing stuff in my book. Today's new discovery wasn't all that adrenaline-inducing, as trails go, but it was still fun. 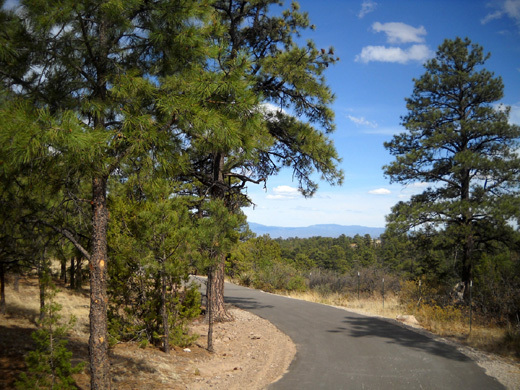 It's one of the few places we can safely ride our bikes around Los Alamos without tangling with traffic or careening off one of the cliffs on a gnarly trail we aren't skilled enough to ride. 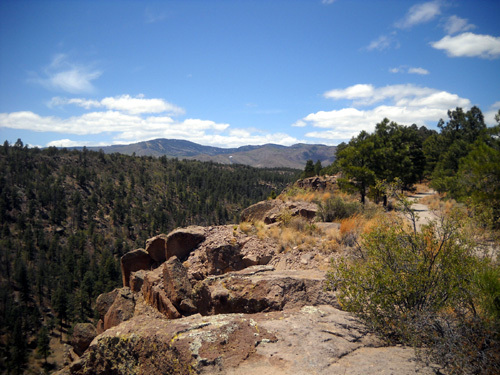 We found this trail in 2009 when we first visited Los Alamos for the Jemez Mountain races, and ran/hiked it again several times last spring. 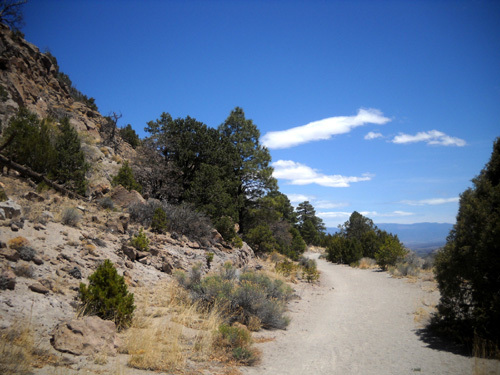 I focused on the Bayo Canyon trails and several other paths in the city's extensive trail network in the May 21, 2010 journal entry. The trails above and through Bayo Canyon are easier for me to hike with bad knees than the steep, rocky Guadje Ridge Trail that Jim ran and hiked yesterday. I've been up Guadje Ridge a couple of times previously and just wasn't interested in going again. I was also tired enough from my last hike at Caprock Canyons to stay in the camper most of the day yesterday with Cody, except for some short walks nearby. Today I was ready for a longer walk. 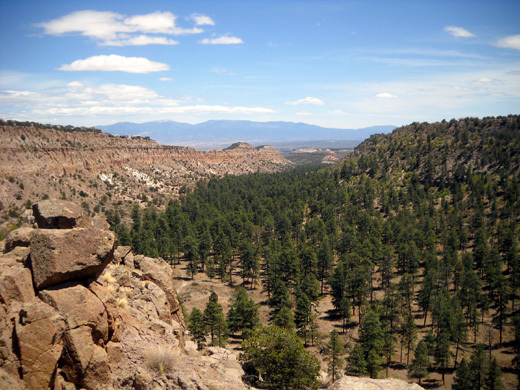 After eight miles up and down Guadge Ridge yesterday, Jim wanted an easier hike today as he tapers for the Jemez 50K on Saturday. His knee is feeling great but he doesn't want to push his luck. The Bayo Canyon Bench Trail sounded as good to him as it did to me. Cody agreed, so off we went! 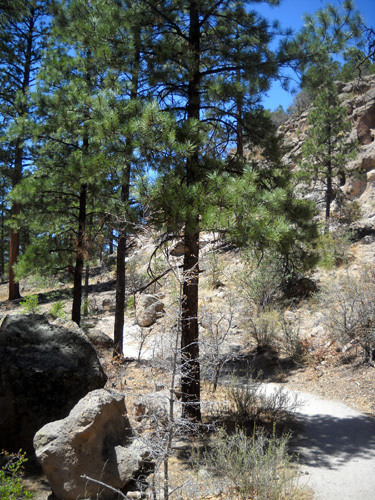 This trail does have hills and rocks but it also has some smoother, flatter, sandy stretches. We waited until early afternoon for the overcast skies to clear. The last two days were so sunny and dry that we were a little surprised by the clouds this morning. The area desperately needs rain but humidity levels continue to be in the single digits and teens. 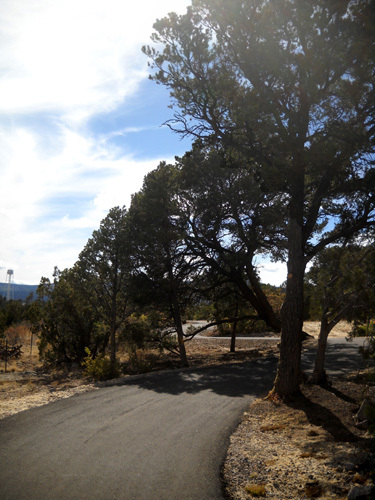 We drove through town to the trailhead parking area on Bayo Canyon Road, just up the hill from the only roundabout we know of in Los Alamos. 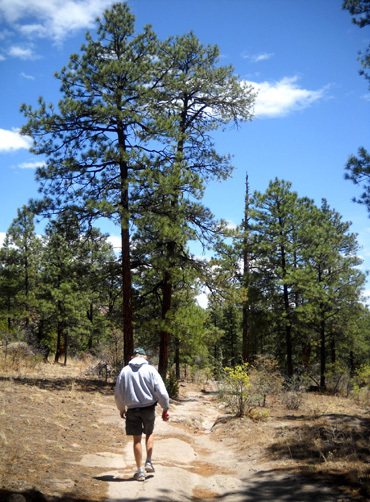 Shortly into our hike we "ran into" Kris Kern, one of the local ultra runners who organizes the Jemez Mountain runs. We talked with him about the race and the very dry weather. 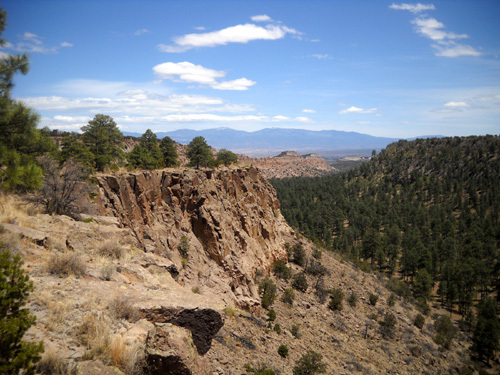 Los Alamos has reportedly gotten less than half an inch of rain since last fall. 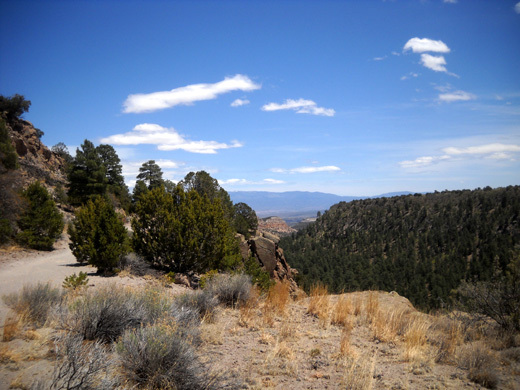 An Albuquerque TV station said the official precipitation there is .14 inch of rain (that's 14/100ths of an inch) for the first 5� months of the year. Their yearly average is 8 inches. Can you say "tinderbox" conditions??? 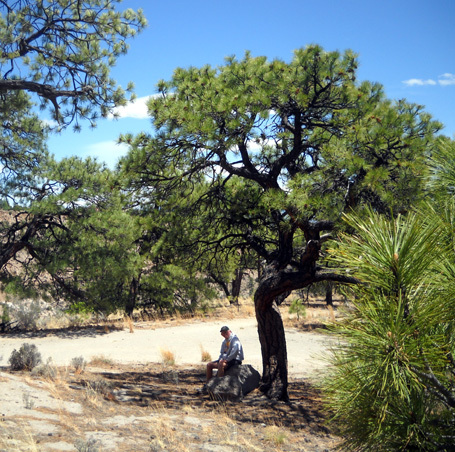 What we could easily observe today is that the trails are extremely dusty, some foliage is wilted, and there are very few wildflowers in bloom. Plants are simply trying to survive and don't have the ability to put forth their spring show of flowers. 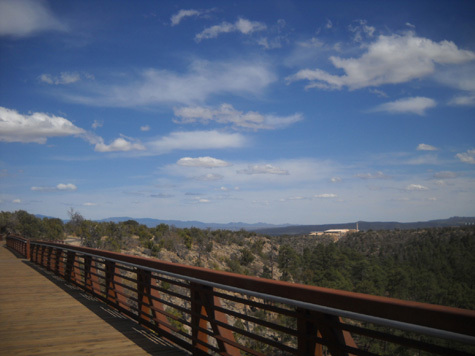 We walked out and back on the north rim of the canyon (i.e., the Bayo Bench) for a total of 3�-4 miles. I was hoping to maybe ride my bike on this trail while we're here but I forgot how many rocks and ruts there are; I think it's probably beyond my cycling skill level. On the way back to the camper we bought a new inner tube for our TriCross bike. The rear tire went flat a couple days after I ran over a tough thorn at Caprock Canyons last week. 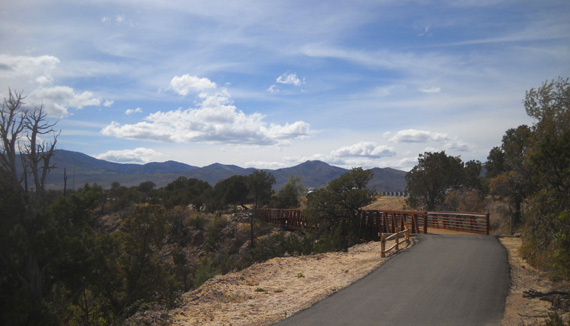 After fixing the tire Jim dropped me off at the nearest trailhead for a new paved hike-and-bike path on the south side of NM 502 across from the airport. The remaining photos in this entry are from today's ride. 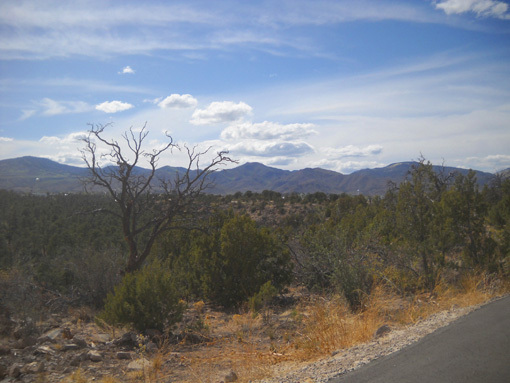 The first four pictures are outbound, toward the Jemez Mountains. 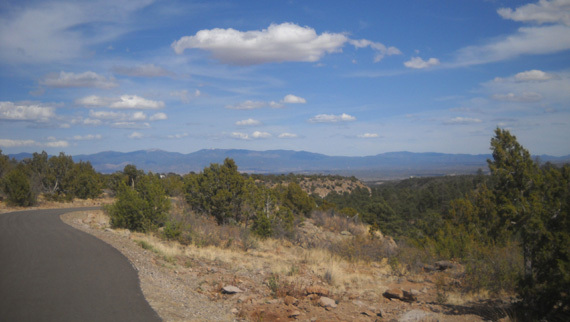 The last six are on the return, toward the Sangre de Cristo Range. 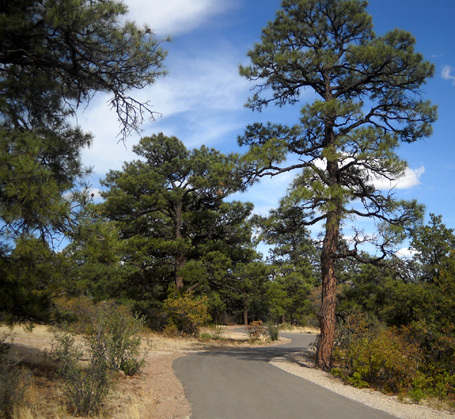 Although the Canyon Rim Trail is only 1� miles long, one end of it is convenient to our camping site east of the airport and it does connect to other trails in the extensive Los Alamos trail system. 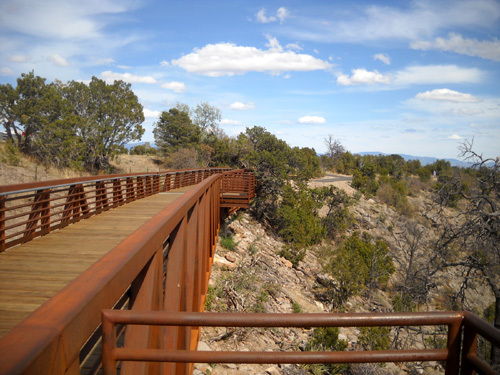 Trail users can cross over the highway at the western end, pass through East Park, and continue on to the Mesa Trail, Graduation Canyon, Pueblo Canyon, and far beyond. 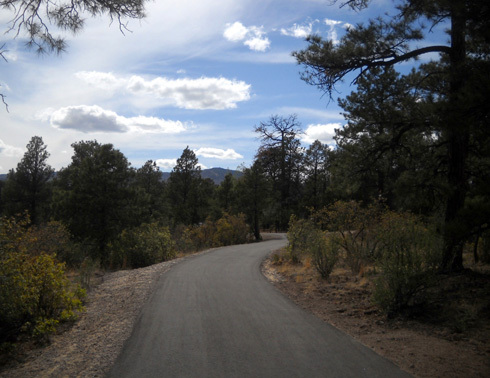 Today on the bike I just did several out and backs on the new paved section for a total of about nine miles. 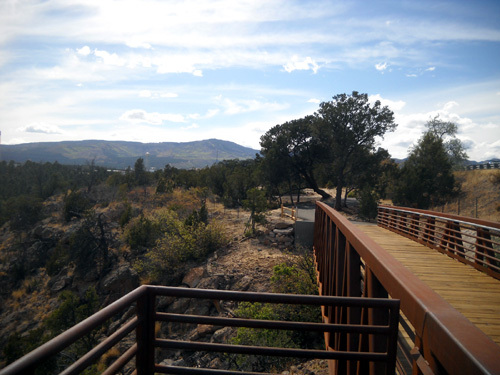 The path has gentle ups and downs and enough curves, bridges, and views into and across the Los Alamos Canyon to make it interesting. It is far enough below the roadway and obscured by enough trees that traffic noise isn't a problem, at least when riding a bike. It might be more noticeable when walking or running. The building in the distance is on National Lab property on the South Mesa. 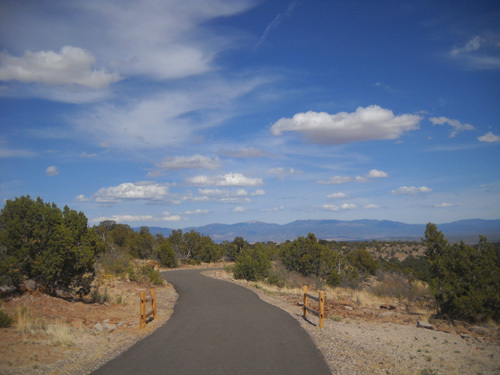 I plan to ride this trail more while we're here, and explore one or more trails on the other side of the road on foot and/or bike.